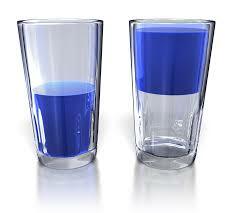 What does a New Yorker see when viewing a glass 48% filled with liquid? Forty-eight percent is not quite half. And that is analogous to our lives. Should we quibble about the 2% we don’t have? Can we be happy with 48% and not worry if it’s half, or whole, or empty, or full? It may not seem that way to you right now, but if you think about it, you have everything you need, right now. As my friend Byron Katie would say (go see her website, you won’t be sorry), “How do we know we don’t need what we want? We don’t have it.” So if you accept what is — and what is, is that you have a 48% full glass of New York City water, which is delicious and comes from a nice reservoir in the country, by the way — you’ll be a lot happier. Now, on another upaya, you think that what you have is a glass of New York City water…but look deeper. What’s in that glass of water? Everything. It is teeming with life, and minerals, and chemicals. It’s rich! It has color, texture. Some say water should be “pure” and have no properties. On what planet?!? You want distilled water, go to the drugstore and get some. It has no flavor, no oomph. Would you like your life to be like that? No flavor, no oomph? Yes, it has chemicals and spores and such that you don’t want to drink…so you get a water filter and get rid of those things. There’s nothing wrong with having a little discrimination. But don’t filter out everything. Keep some flavor in your life. We all have to eat a pound of dirt before we die. What doesn’t kill you makes you stronger. So, drink life to the fullest, Darling. And if your glass isn’t full enough for you, you can always go back to the tap. And I don’t mean the one on the sink. There’s a faucet within you, Darling. Turn it on and fill your cup to overflowing! And enjoy, in the best of health. L’chaim!